From: http://www.universeofsymbolism.com/turtle-symbolism.html The strong and hearty sea turtle takes vast journeys in the sea, letting the tides take her where they will. She surrenders in infinite trust that all will be OK, and she will arrive when and where opportunity will serve her. This is a beautiful lesson of enjoying the journey of your life trusting in the flow and partaking of the blessings that are bestowed upon the way. In life there is no absolute destination … but a myriad of journeys, this is the symbol of turtle. I like to see the turtle as having the symbol and magic of serendipity… experiencing happy accidents. From: http://www.spiritanimal.info/turtle-spirit-animal/ The turtle wisdom teaches us to walk our path in peace and stick to it with determination and serenity. 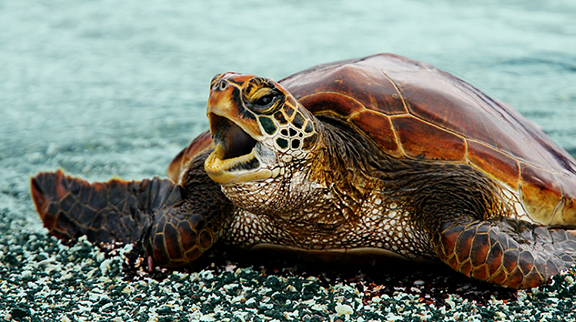 Sea turtles move slowly on land, yet are incredibly fast and agile in water. People with turtle energy may be encouraged to take a break in their busy lives and look around or within themselves for more grounded, long-lasting solutions. Traditionally, the turtle is symbolic of the way of peace, whether it’s inviting us to cultivate peace of mind or a peaceful relationship with our environment. What lessons are gained from Turtle Mother and the baby sea turtles?